About the Author: By night Nina G is a comedian performing at comedy clubs and keynote speaker. By day she is a counselor at a California community college where she works with students with disabilities. In 2015 she premiered her one-person show Going Beyond Inspirational and produced the first ever comedy compilation album of all comedians with disability aptly titled Disabled Comedy Only. Her TEDx Talk, The Everyday Ally, is helping to teach people without disabilities to be effective allies. Summer 2019 Nina will release her second book Stutterer Interrupted: The Making of a Stuttering Stand Up Comedian. Learn more about Nina G at www.NinaGcomedian.com. 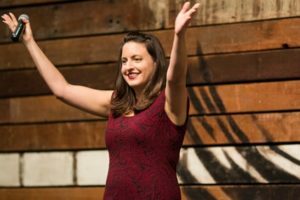 Stutterer Interrupted: On Disrupting the Interrupting is about my own journey to speak my mind not just as a stand-up comedian but also as a person. All my life my dream was to become a comedian but the dream died because of my stuttering. This is the story of how I became to embrace my stuttering (with help from the community) to make this dream come true. Thanks for checking out my video. I would love to hear your thoughts on times that you interrupted yourself in ways that I did and how your dealt with that or how you came to notice it. I was tempted to say this is inspiring, in part just to make your head explode. It is a moving 7 minutes, though part of me felt bad wondering about those who did let their dreams die when they didn’t have to. I know! How many dreams have died because we didn’t have the role models to do the things that we wanted to do?! What do you think is a way we can ensure that these dreams don’t die? Do you think those things that can be done are different for people who stutter compared to SLPs and other helping professionals? Rebecca: Thank you so much for your kind words and taking the time to consider my video. I hope you will also help PWSs understand fluenc and stuttering in a different way <3. I enjoyed watching your video! As a future Speech-Language Pathologist, I’m particularly interested in listening to your TEDx Talk to learn more about ways that I can become an effective ally for others. Since embracing your dream as a stand-up comedian, do you find that you still struggle with old feelings from the ‘stuttering ice berg’ when performing? Additionally, what do you feel is the best piece of advice SLPs can give to individuals who stutter? Thank you so much for taking a look at the video! For me personally, they old iceberg feelings are there but when you understand them they can be contained or processed through a bit easier. It is like you have been there done that so you already have a framework to understand the feelings that surface. I have one story where I talk about this. Take a look at it and let me know if you have other questions about that experience— https://www.huffingtonpost.com/entry/stuttering-stand-up-comedy-and-drive-thru-windows_us_577067a1e4b0fa01a14044cc. The advice that I would give SLPs is to think about social justice issues for people who stutter. I would love for SLPs to consider their role outside of the therapy room to improve the lives of the people they treat. I would like to see helping and medical professional of every kind to be advocate and treat the discrimination that their clients experience, just not the symptoms of the individual. This video led me to have a rollercoaster of emotions! I love how you took other people’s negativity and turned it into a way to educate others in a lighthearted manner. Your positive outlook and gift for speaking is a wonderful way to teach people about stuttering on the stage! I loved hearing about all of the experiences you have had over the past 8 years and how it has shaped you and has helped you encouraged others to pursue their dreams. Thank you for sharing your story! Thanks so much for taking the time to read it! I hope you eventually check out the book ;-). I would love to hear what you think about the rest of it. Thank you for sharing your story! It is so inspiring to hear that you continued to strive for your dream of becoming a comedian despite the hardships. It is so great to hear that the conference you attended had such a big impact on you. Despite being around many other individuals who stutter and feeling that sense of community, what else occurred during the conference that positively influenced you? Also, you spoke about being a teenager when you felt as if your dream of becoming a comedian died. At what age were you when you began to stutter? Thanks! I started to stutter when I was about 8 years old. Regarding the conference I can’t think of single advice, workshop or intervention besides just being around other people who stuttered that stuck out for that year. One of the primary things was having other women reflected back to me. This video is another part of my one person show as well as a chapter in my book about having interactions with women who stutter: https://www.youtube.com/watch?v=PREubIDeGhc. I think that it explains so of these feelings. It is funny that just being in an environment that is validating can transform you <3! Thank you so much for sharing your story! I love how you put a humorous spin on many of your struggles! I feel like so many people can relate to humor! You also shared some very deep emotions that I believe many individuals who stutter can relate to. I loved the analogy you used about clouds and icebergs and changing cloud shapes is a lot like changing perspectives and transforming your iceberg. It is so inspiring that you discovered your dream again once you were able to develop a new perspective. Understanding a woman’s perspective on stuttering was also so valuable! I am a SLP graduate student, and it is so encouraging that going to a conference gave you so much support and courage to find your voice. I am a speech student taking an intro to communication disorders class. I love your comedy and the twist you put on talking about your stutter. how do you react to people interrupting you when you are having trouble speaking and they try to rush you, finish your sentence, etc.? What advice would you give to a young person with a stutter that is holding themselves back and doesn’t think they can do certain things as you almost did with your dream of becoming a comedian? Great questions Sam! I think it is important for youth to figure out a way to stick up for themselves that feels authentic to them. Sometimes this will be with a simple request, sometimes with humor. It is difficult to say what is right for everyone, but I think they should learn to assert their voice. I also think it is important for SLTs to advocate at the school to build a foundation for this. To counter someone thinking that they can’t do something, I think role models are important. It needs to go beyond famous people which is why conferences are so important! Knowing what you know now and facing your challenges today how would you encourage other people who stutter to live out their dreams and to not be held back by the challenges that they themselves might face because of the speech disorder? I once saw an iceberg tip (in Iceland of course 🙂 ). I still cherish that moment as one of the most amazing ones, as that was so beautiful, so spectatular, to see that beautiful seagreen color suddenly appear. I’m so thrilled your iceberg tipped as well and look what a spectacular women came out of the darkness! The way you educate the world (yes soon, baby, soon! ), and not just about stuttering, but also dyslexia and other disabilities, using your struggles to do the exact opposite (standup and write) and through that tip other people’s icebergs, is mindblowing. Keep talking my friend. The world needs you.